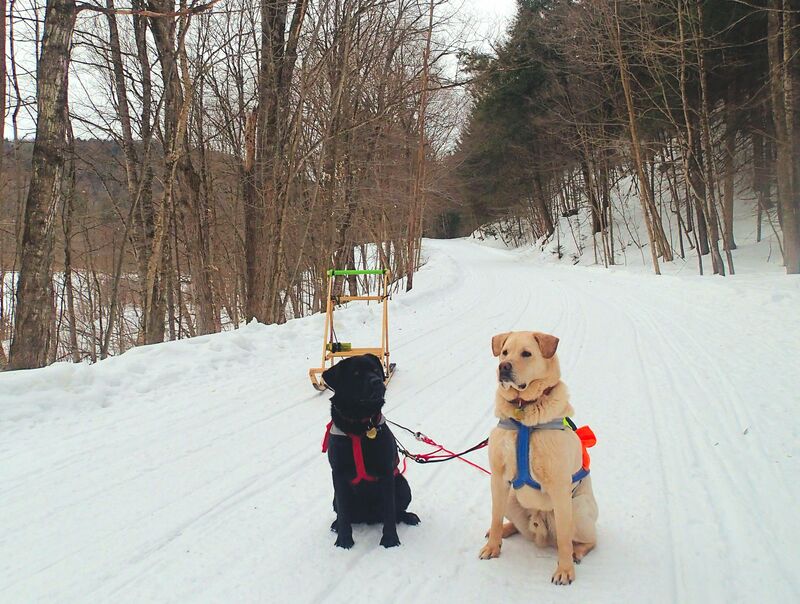 She turned to the sunlight, And shook her yellow head, And whispered to her neighbour: “Winter is dead.” (A.A. Milne) | Vermont Paddle Pups! I picked up a new member of the VPP family last week. 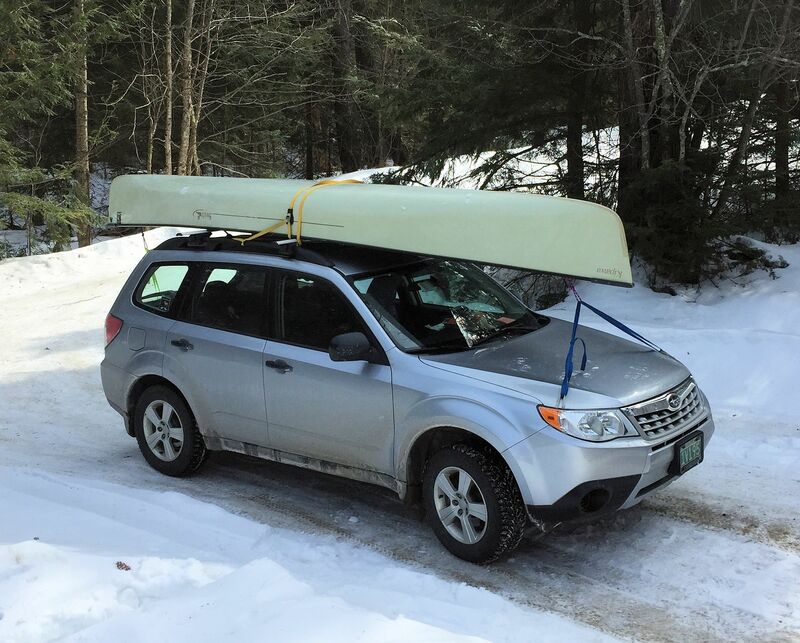 After searching Craigslist and paddling.net on a daily basis for the past 5 months, I finally found a suitable solo canoe for sale. And it was located only 2 hours from here! Well, she’s on water…except it is still a bit frozen! 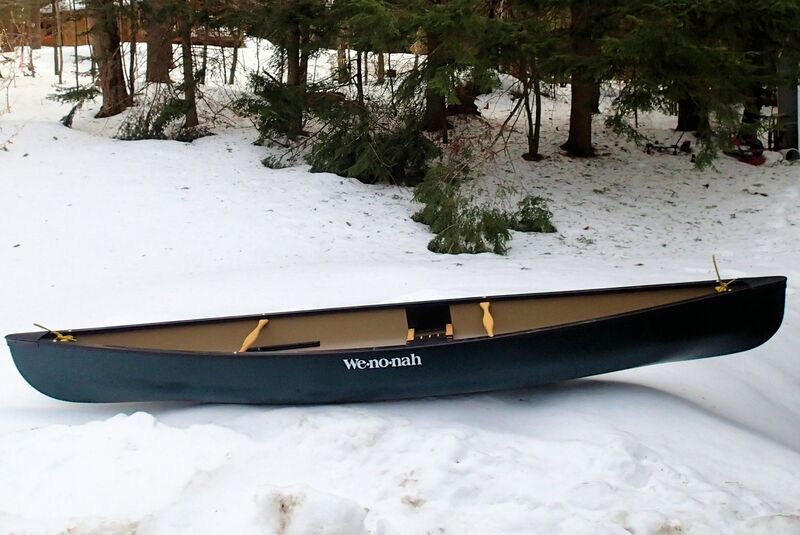 We are now the proud owners of a Wenonah Fusion solo boat…one of the last of the Royalex models. It will be great fun to experiment with this boat, and hopefully, Griff and I can have some great adventures. Of course, Edgar will also get his turn, too! I have been looking at paddle options, and in addition to our straight and bent-shaft paddles, I will pick up a kayak style paddle for use with this canoe. It is so encouraging to be ordering paddling gear! The Swift is off to the canoe shop, for a yoke replacement…a bit of rot was evident when we bought the boat, and now we feel it is time to replace the yoke, to retain the structural integrity of the canoe. Wow, twice in a week I had to tie down a boat on the roof…maybe spring really is here. But back to winter activities…. 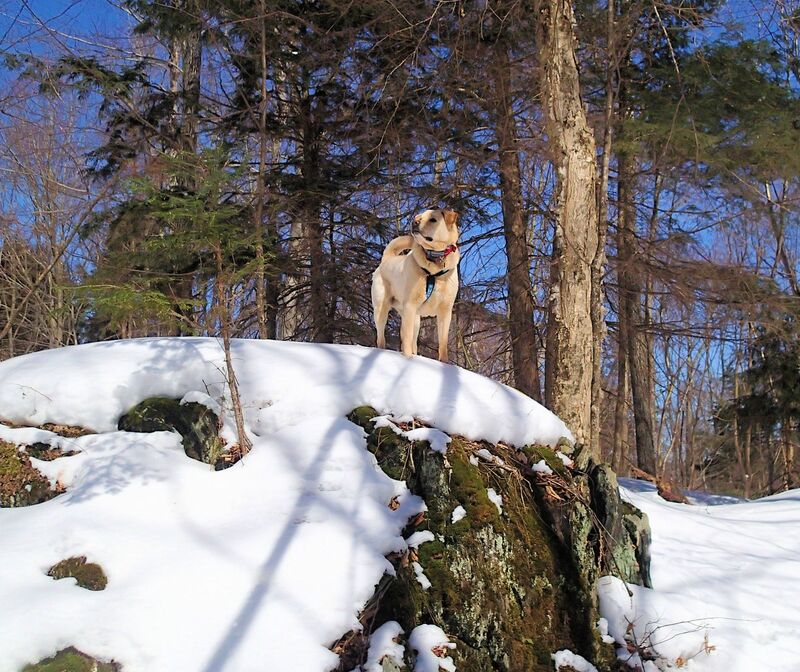 One of our local trail networks has been logged over the winter, inhibiting our use of those trails. Well, now the big trucks and skidders are gone, so a whole new section of sledding and skijoring trails has re-opened for us. With all the snow we have, and with the temperatures not getting too warm, we should be able to have fun here for a few weeks. 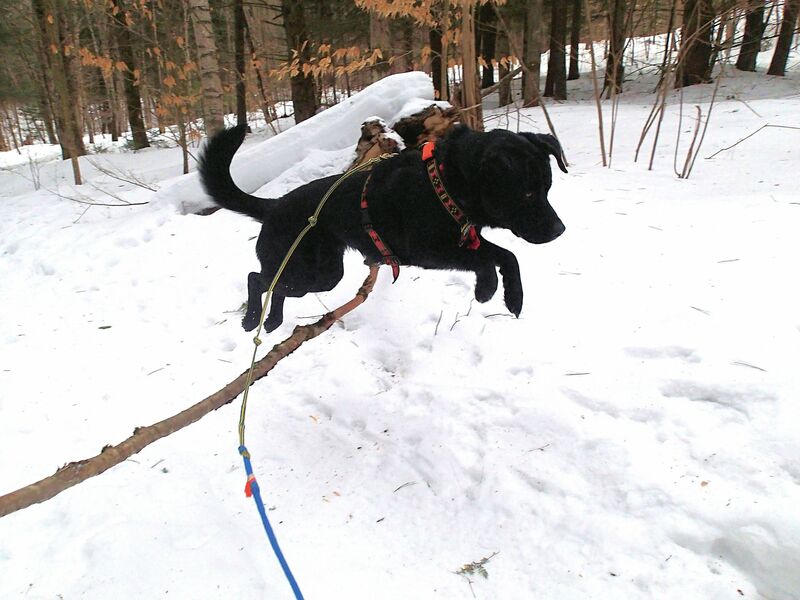 I took Edgar out for a solo sledding jaunt, and he had a blast! 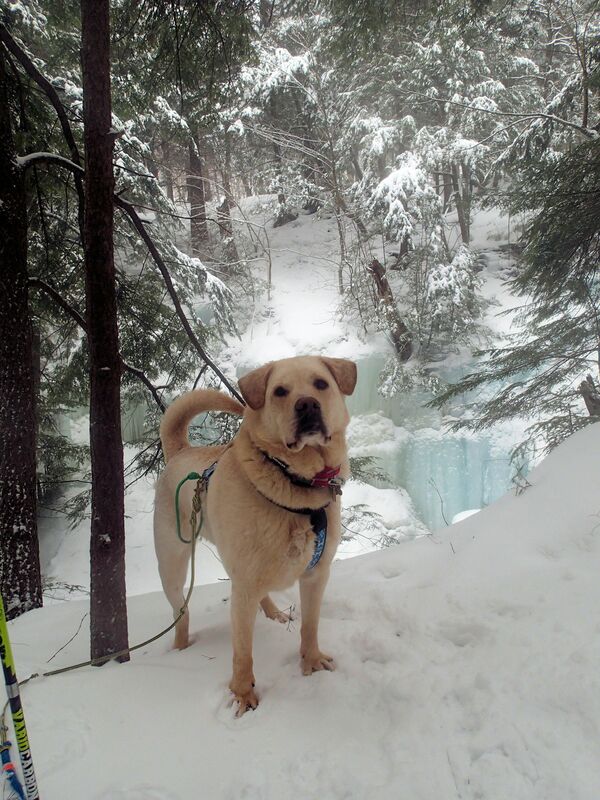 He really has improved on his ability to run straight, and on-trail…I finally made him turn around, when the snow got a bit soft and sloggy for him. 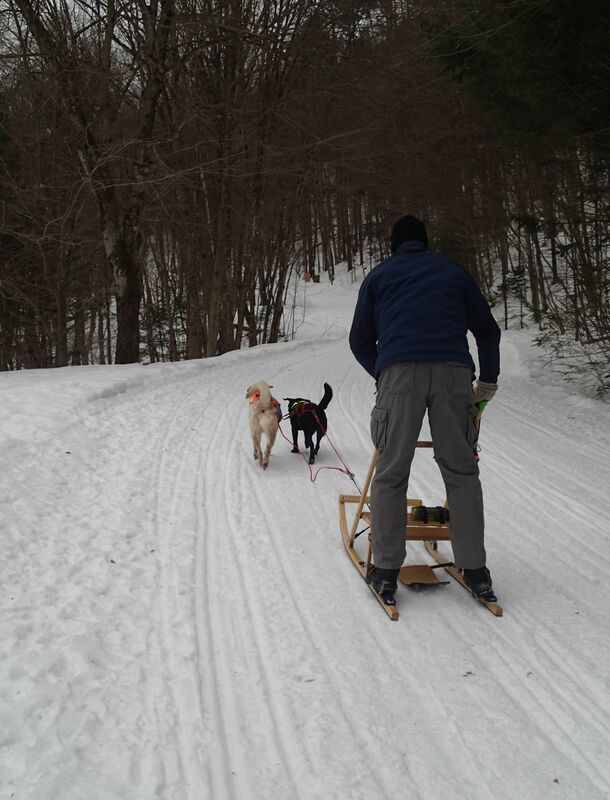 He has also had a bit more skijoring…while I was playing in an ice hockey tournament weekend, Edgar and his “dad” went out for a nice long skijor, up and down the hills of Ryder Brook. 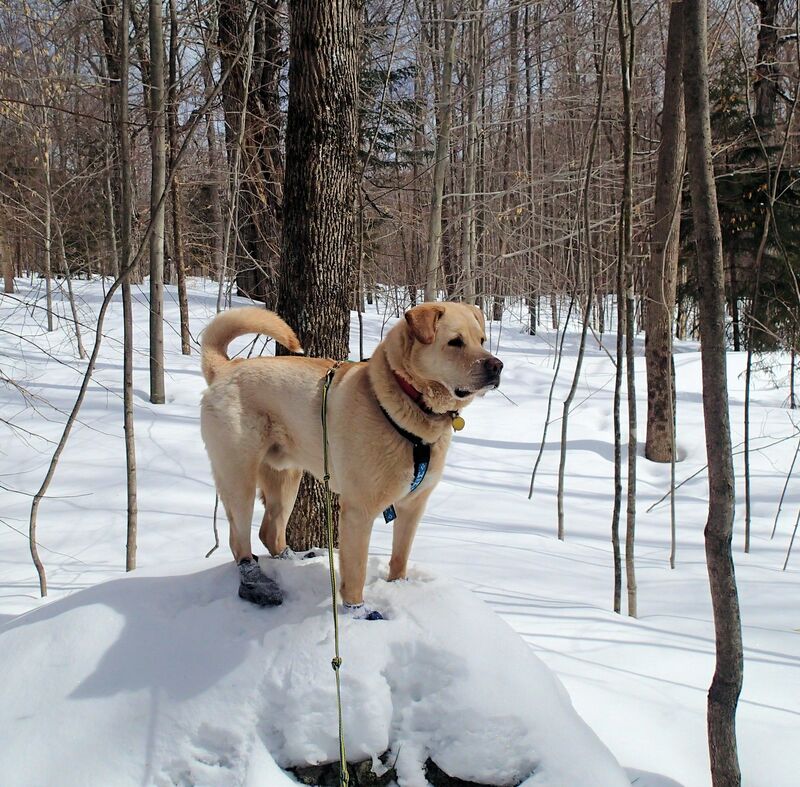 Griff and I went out there to have a ski, but the trails were solid frozen crust, and windblown with “styrofoam” snow…so we snowshoed, instead! 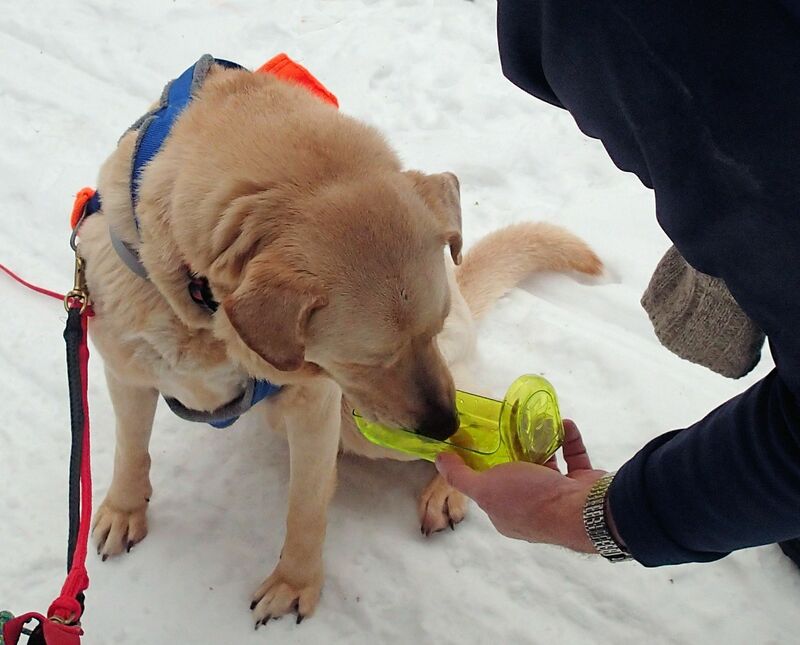 There is still a whole lot of snow in our area…..
A few days later, we took the “team” back out…firmer snow, and slightly cooler temperatures, made for a nice run for both dogs. Gryphon actually kept up with Edgar , and certainly got his exercise for the day. Hiking has been very interesting lately…we had a brief thaw/freeze cycle, resulting in some frozen crust, very slick trails, and those dreaded frozen post-holes. Unfortunately, my trusty Microspikes had one chain link rip out of the eyelet. 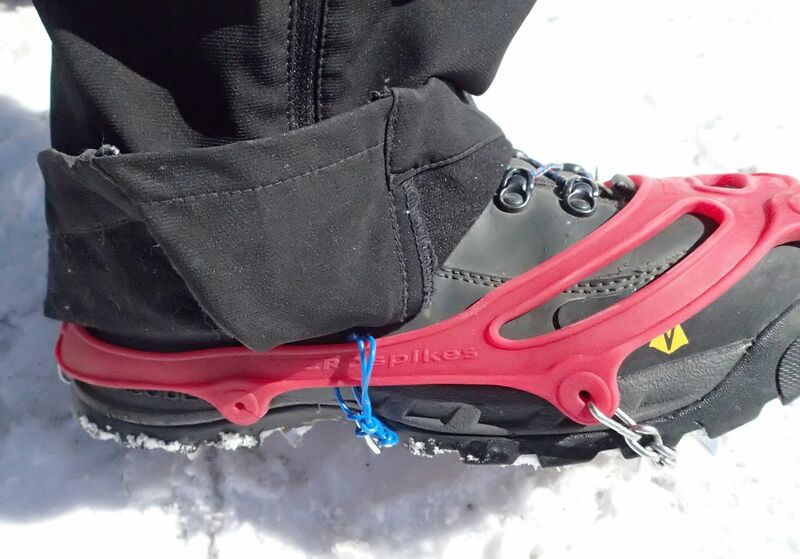 This time of year, and until late April, trail traction is essential for safe hiking in Vermont. They are warrantied by Kahtoola, and I hope to hear from the company soon about a replacement pair. In the meantime, some coated wire has worked to hold the spikes in place. The cold has also necessitated a return to the booties! 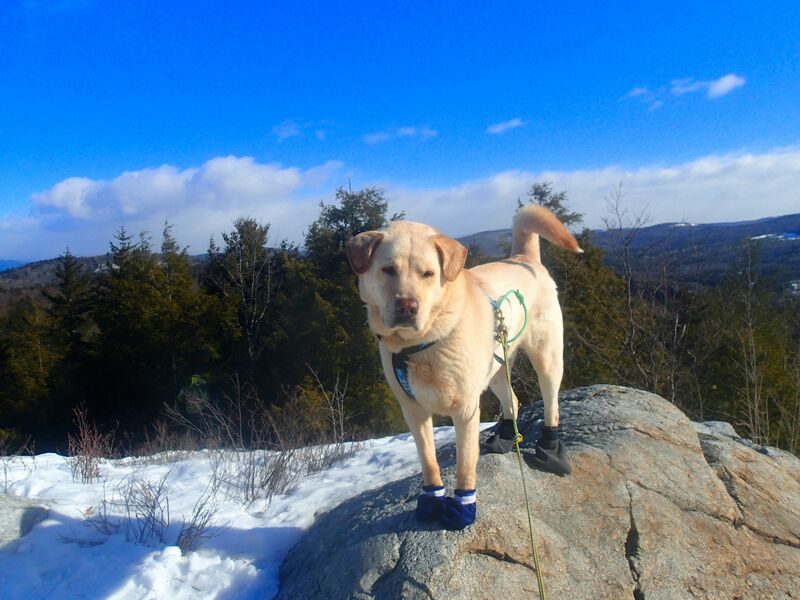 The dogs really thought our short span of above 20 degree temperatures signaled the end…but no, lately we have hiked a lot in very cold temperatures, and the booties are essential. Actually had temps in the 20’s….nice to not need booties! 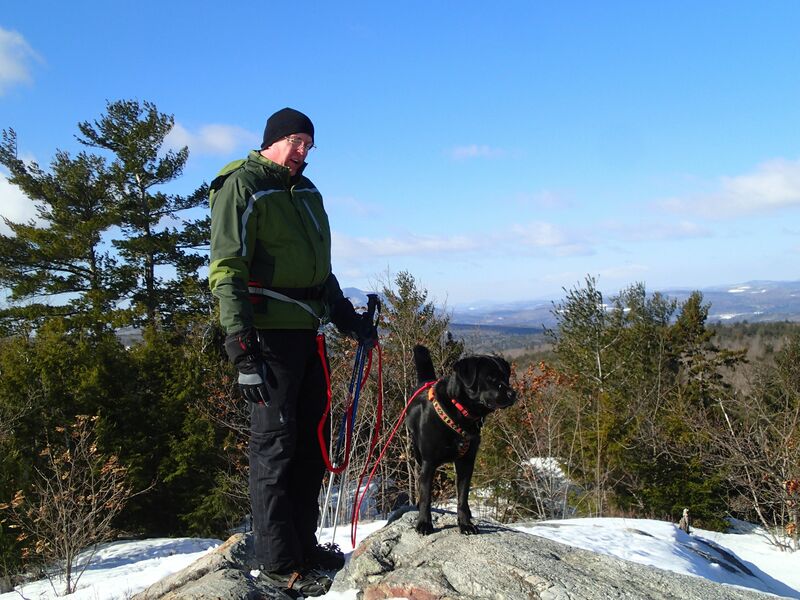 We headed to NH, on a bitterly cold and windy Sunday, for a family visit…enroute, we stopped at a small trail network where we had never hiked. We found the trailhead, and after a short, crunchy,crusty,post-hole laden trail, we came to a small steep pitch in the heavier woods. 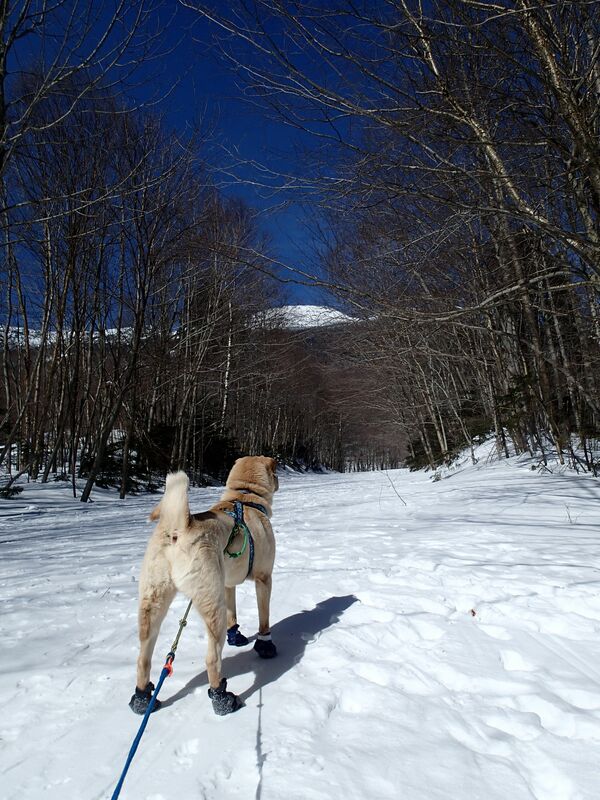 The trail was glazed ice, with breakable crust on the sides, where we could guide the dogs. Our trail traction allowed us to negotiate the icy climb, and we were rewarded with a lovely view. Winds blowing 30-40 mph made for a chilly, but enjoyable stay at the overlook. 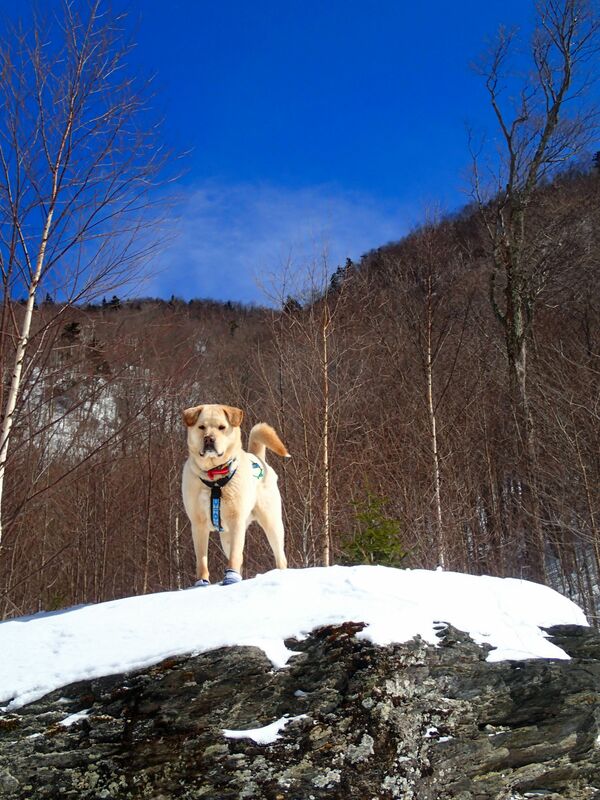 Encouraged by our success in the wind at the Ledges trail, Griff and I headed out the next morning to hike up into Smugglers’ Notch…again, extremely gust winds, wind-chill well below zero…but how can you not hike on a beautiful bluebird sky day? So, lots of excitement coming up…the Paddlesports show in a few weeks, more gear to use and review, new paddle gear arriving, Game of Thrones in 20 days, WooHoo! As much as we love the snow, and winter fun…we are ready to move on to spring.